Enjoy the second year of Five out of Ten – Change, Power, Space, Time, and Heart – in one lovely package. A portion of sales from Year Two help support SpecialEffect, a charity that works to improve the lives of young people with disabilities. 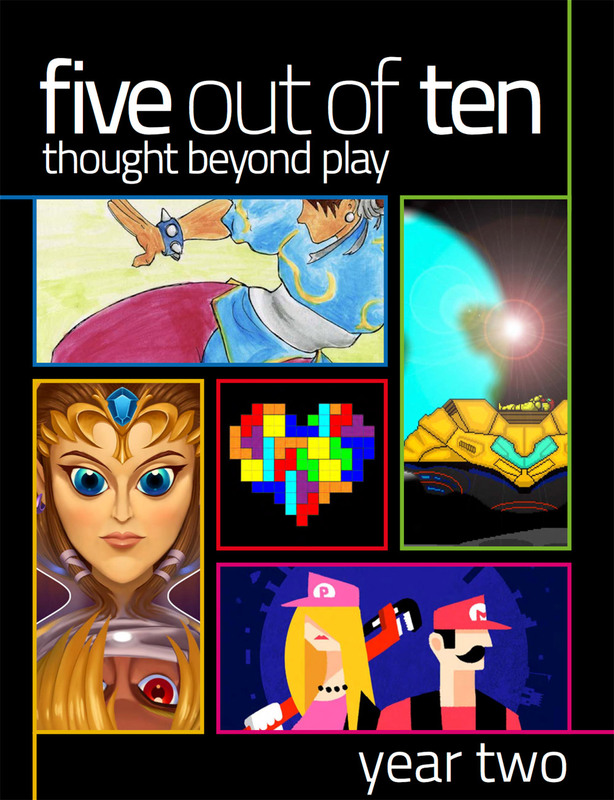 “How can videogames change the world?” Our first anniversary special, in aid of SpecialEffect! “Now you’re playing with power.” Get a case of mistaken identity, lost in a maze while on an Odyssey, understand a cycle of ignorance, a dream of good government, and a Wild Rumpus. “Never seems to be enough space.” Read about a fourteen year quest to complete Commandos, the symbolic death of Aerith in Final Fantasy VII, the failed men of failed gaming satires, the virtue of discomfort in games, and the capacity of games for empathy. “Time spent doing what you love is never wasted.” Explore the music of memory, the excess of bullet hell, the sublime of space exploration, the death of the military shooter, and the emotions of animals. “Open your heart, it’s gonna be alright.” Go under the radar with Solid Snake, discover the power of words, get well, discover the nature of freedom, and unwrap a bundle of joy. Featuring work from: Leigh Alexander, Becky Chambers, Chay Close, Christian Donlan, Jordan Garland, Dan Griliopoulos, Grant Howitt, Johnny Kilhefner, Joe Köller, Cameron Kunzelman, Helen Lewis, Patrick Lindsey, Joe Martin, Tauriq Moosa, Maddy Myers, Christos Reid, Elizabeth Simins, Ed Smith, Daniel Starkey, Zoya Street, Meg Townsend-Ruttan, Kaitlin Tremblay, Jordan Erica Webber, and Alan Williamson. Your purchase contains a collector’s edition Year Two PDF, plus MOBI and ePUB versions of each issue from 6-10.